So you figured out you’re a goddess, now what? Let’s be honest, we can’t feel like a goddess 24/7…. Between juggling life, relationships, work, trying to keep up with the freshest memes: we know it’s hard to always embody the goddess energy. Check in with the following list when you need to remember just how powerful you are. You ALWAYS have that divine feminine flame waiting to be sparked within you. It’s just about having a map back to that space where you know you are pure magic. Here are 7 surefire ways to tap into your inner divine feminine sparkle spirit today. 1. Create sacred space. Every Goddess should have an altar. Candle, incense, crystals, cards, statues. Even if you only can stand at it for a seconds it will help you ground and re-center your day.. I have sacred spaces all over my house- and even in my car. 2. Accept, listen to and express your emotions. Angry? Punch a pillow. Sad? Have a good cry. Head spinning? Write in your journal. Raging? Throw some eggs at a wall. 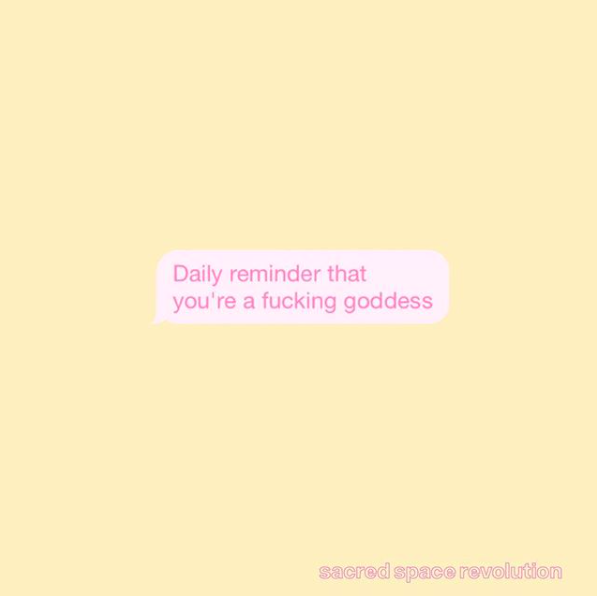 Honor whatever you’re feeling- a Goddess doesn’t let stuck energies dull her glow. 3. Make time for meditation. A Goddess knows the best way to predict the future is to create it and she does this best from the place of stillness. 4. Manage your negative self-talk. First step is to become aware you are doing it and then next step is to start to reprogram the neural pathways. Find a mantra, try hypnosis, write yourself a forgiveness letter, talk to a therapist. 5. Connect with Mother Earth. A Goddess plugs into her power barefoot in the earth. If you are an urban Goddess, keeping succulents and crystals on your desk or touching a tree on a lunch break will do. 6. Take care of your body. Warm lemon water, gentle stretches and deep breaths are all like little love notes to your body. 7. Listen to your souls wisdom. Create something from this place today. Write a poem, paint, follow the call and make something from the inside out, just cause.